After ignoring their finances for a long time, the couple finally faced reality one night when they sat down and added up all of their debts, and compared it to the revenue they had coming in. When they realized how much they owed, they decided to make some drastic changes so they could pay it off and stop worrying about money. They had a white board with a list of all their debts, which they updated every time a payment was made so they'd continue to be motivated. After 20 months, they were completely debt-free. After that, they continued with their minimalist, frugal habits and were able to save up enough money to build themselves a custom tiny house on wheels. They've been living in the tiny house for over two years now, with their two children, and plan to continue living in it for as long as they can. 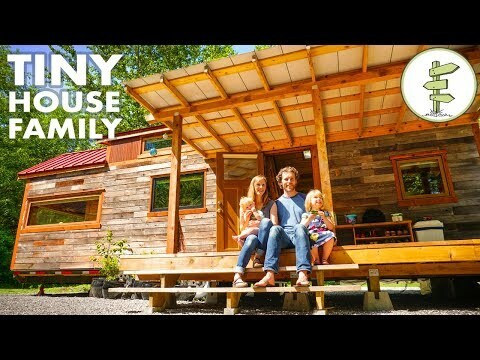 They are currently saving money to buy a small acreage where they will build a larger off grid home and keep the tiny house as an income property. We're very inspired by this young family's dedication to improve their lives by paying off their debt, by their awareness of their energy consumption, by their efforts to buy less and live a low waste lifestyle. They're trying to make positive change in every aspect of their lives, and that's not always an easy thing to do. Thank you, Jocelyn and Jarvis, for sharing your story with us! And for the beautiful day we spent at your place!